For many couples, the beauty of a contemporary marriage ceremony with an independent (non religious) celebrant is that there is no set “script” and therefore you can personalise it as much as you wish. Some couples may write everything – their love story, their vows, their blessings, and simply ask the celebrant to present what they have written and officiate the marriage. More often though, your celebrant will work closely with you over two or three meetings, listening to your stories and ideas, and then write these down in ceremonial format for you. “Fun Facts” – list some quirky, fun, or unknown facts about one another on the back of your Order of Service, so guests have something interesting to read and talk about while they wait for the bride to arrive! “Love Story” – write your love story, for instance, the tale of how you met, how your partner proposed, the best things that have happened, the toughest things you have come through together. Describe what it is that you most love about one another. Either your celebrant or a guest could read this, either in prose or as a poem. You could also ask any very special friends and family who are unable to attend your wedding (eg because they are overseas, elderly, or ill) to write a short letter or story about your romance, or what marriage means to them and what they hope for you in the future. These could be read out during the ceremony (as opposed to at the reception). “Vows that Wow” – by writing your own personalised vows you can ensure that no-one else will have said what you say to one another as you make your most personal and heartfelt promises. Start with two or three things you most love about your partner (the “why” of marrying) and then state two or three things you promise to do in the marriage (the “what” of your future together). It’s ok to include a light hearted jokey promise, e.g. to bring one another a cup of Nespresso in bed each morning, but avoid flippant jokes. This isn’t the time to try for jokes from the crowd. Alternatively, as your “something borrowed”, why not recite the same vows your parents exchanged at their wedding, years ago? Or, instead of being guided by the celebrant as to who speaks first, ask your best man to flip a coin at that moment in the ceremony, to see who will give their vows first! “Ringbearers with 4 legs…” – there’s no rule that says your best man or page boy has to be your ringbearer. If you are just as much in love with your pet pooch or horse as you are with each other, why not have the rings borne in by 4 legs? Just make sure the best man has treats in his pocket to bribe the ringbearer and reward for good behaviour (co-incidentally the same rule tends to apply for child ringbearers!) If you love to fish, or sew, or craft, or tramp, ditch the “satin ring pillow” and use a fishing rod, circle of wood, handmade cushion or felted flowers instead. Another nice touch is to have the rings blessed or warmed by each guest (or just family guests) before the couple exchange them. This is most safely done by having the rings together in a small drawstring bag which is passed around during the start of the ceremony. “Words from the heart” – choose a reading, blessing or poem, or lyrics from a song, that mean something to you. Every person is different in how they react emotionally to a piece of poetry or prose about love. For some couples, the jokey nature of Pam Ayres might sum up how they feel toward one another, while for others, the classical poets or philosophers will help set the tone of a more formal wedding ceremony. The internet is overflowing with possible choices, and it can be a little overwhelming. Luckily some fabulous people (many of them celebrants!) have edited books of wedding poetry and readings, which you can access in your local library and read through until you find something you like. One couple I married were fortunate enough to have a poem written by the bride’s grandfather to her grandmother when they were first “courting”. There wasn’t a dry eye in the house after the poem was read, 50 years after it was written. “Music has charms” – Music can tug on the heartstrings in ways that words alone cannot. You can personalise your ceremony very effectively by choosing music that suits you both, and that fits the style and tone of your ceremony. Music is usually played when the bride arrives, and when the couple departs after being pronounced married. Choose something that is memorable and meaningful. Another way to effectively use music is to have a guest read some lyrics from a song during the ceremony, in place of a more traditional poem or blessing. One couple I married chose 5 songs they loved, and had a verse from each read together as one piece. It was a surprise from one partner to the other, and very effective and beautiful! “Unity Ceremonies” – small “ceremonies within ceremonies” have become popular for couples who wish to use a visual and tangible ritual to symbolise their love. 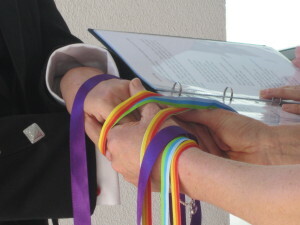 For instance, handfasting with coloured ribbon, blending different coloured sands in a “sand ceremony”, lighting candles, or releasing balloons or butterflies. Another lovely idea is to ask each guest to pick up a small stone before the ceremony (selected by the bride and groom from meaningful places such as where they met, where they live now, and where they were married). Guests may hold the stone during the service and make a special wish. The couple later collects the stones into a large vase to display in their home. For couples who love nature and their garden, a symbolic gesture might be to place a scoop of soil from each of your hometowns into a pot and plant a small tree or shrub, to symbolise the merging of your lives together. The right ceremony for you… it is limited only by your imagination!